Easy to learn and simple to use with no pull down menus. Instead all scope features are accessed via on screen buttons. Comprehensive display view controls allow portions of data to be selected and viewed easily. Captured data points can be displayed as they are or joined. Auto measurement of frequency and duty cycle of captured signal. Cursor measurements allow accurate readout of time, frequency and voltage values. Trigger values are also visually displayed and give quick and accurate settings. Trigger delayed view is available. Includes digital amplifications of 2X, 5X and X10 of captured signal and vertical scrolling of scope display. Waveform generation is easy. Just select type, style, frequency and hit "GO". 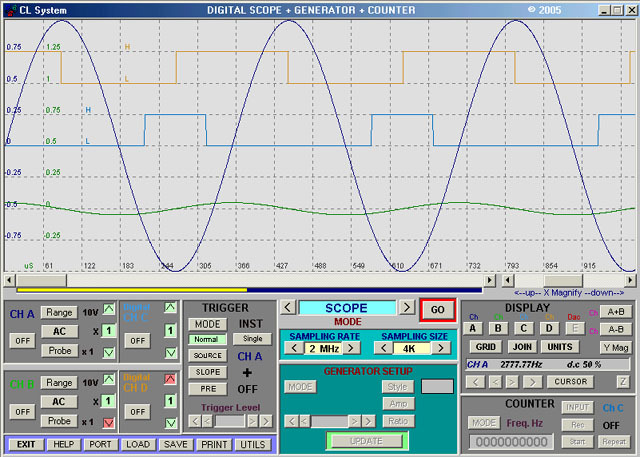 Custom wave can be copied from captured signals, designed in spreadsheets or as a text file and loaded into the signal generator. Frequency measurement, pulse counting and pulse width measurements are easily carried out with just a few clicks of the mouse. Most of the software functions are easily controlled via simple text file command. Therefore, the DSG04 can be easily interfaced to users own program. Minimum PC specifications: 400MHz PC with 16 MB memory, ECP printer port and 10MB disk space. USB cable and software option is available.